Baptized;Attended 2 prison fellowship seminars;Emmaus Correspondence School;Source of Light Schools;Little Lambs Graduate;Heart Cry Basic Bible Study Course;Men of the Bible Study;Truth Project Study;Not a Fan Study Christian Basics Study;Anger Control Study;member of "set up" crew for Church;currently enrolled in Shalom Seminary roughly 50 credits away from obtaining a Bachelor's Degree in Ministry. I sent my very first book to a publisher:E-Couragement from a Prisoners Pen. 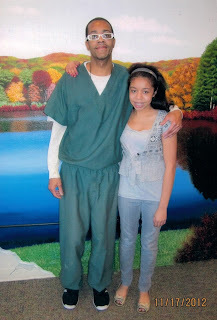 For the most part my coming of age in prison has led to my actually LIKING who I AM! See my crime stemmed. from my not being ok with my natural identity (NERD). Yeah that's me! So as a NERD 4 Jesus I'm ok with being picked on & ostracized. Now I can keep going in the face of my peers taunts of "stop acting white..." Yes,it's ok to be Black & smart. Praise God. So,all these many years later here I AM embodying the Judges advice to "use your God-given intelligence to go far in life."